Blender is an incredible open source cross platform suite of tools for 3D creation. And if you are unaware of the capabilities of Blender, you should watch these stunning Blender made short films and animations you probably haven't seen ever before. Blender 2.56 beta is the fifth beta release of Blender 2.5. Blender 2.5 is undergoing massive changes and the final release date is still quite uncertain. What's New in Blender 2.5? Blender 2.5 when released will constitute an updated user interface, support for custom keyboard shortcuts and most importantly a brand new add-ons functionality which is definitely going to extend the platform remarkably. You might also want to check out current Blender add-on directory. Massive changes to Blender internal architecture. More upgrade coming in for Blender Modeling, Animation System and Physics engine as well. More detailed info on changes coming in for Blender 2.5. How to Install Blender 2.56 Beta in Ubuntu Maverick, Lucid via PPA? Simply do the following in Terminal to install latest Blender 2.5 beta in Ubuntu. Done. Depending on your bandwidth speeds, it might take some time to install. 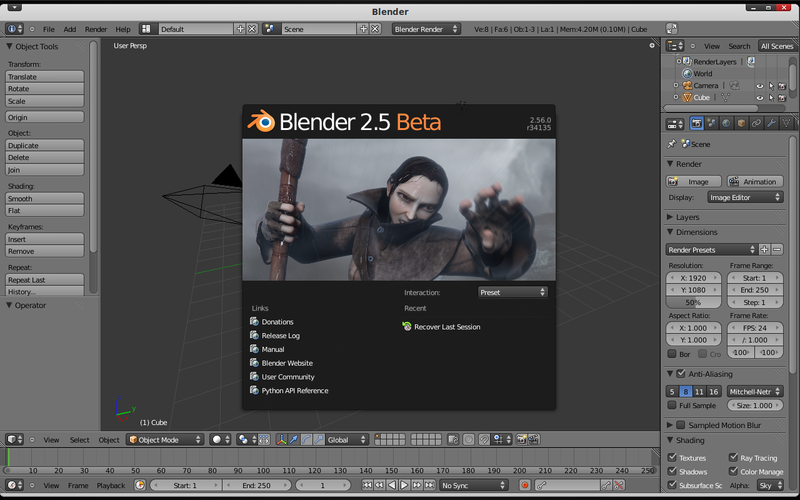 If you are using Windows, Mac or other flavors of Linux, Blender 2.5 beta download link. Blender foundation has produced 3 open movies to date - Elephant's Dream, Big Buck Bunny and Sintel. If you want to learn a thing or two about Blender, may be you should try out this awesome collection of top 12 blender tutorials.